Rachel Dawson was born August 2, 1985 in Camden. She and her seven siblings grew up in Berlin Township. Rachel and her older sisters, Natalie and Sarah, were standout field hockey players. All three would end up playing for the US national team. The Dawson sisters were part of two record winning streaks—208 games against New Jersey opponents and 153 against all comers. Eastern won state titles every year Rachel and her sisters played on the varsity, capturing 16 consecutive Group IV crowns. Sarah was heavily recruited by top Division I programs and accepted a scholarship to the University of Iowa. 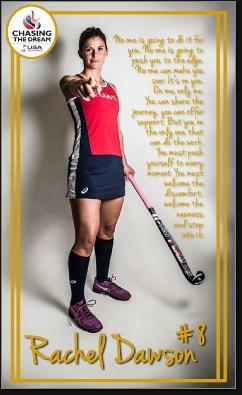 At age 16, Rachel was named to the US under-21 team. Rachel, an imposing defensive midfielder, accepted a scholarship from the University of North Carolina. She was named ACC and NCAA Freshman of the Year in 2003, and followed that with First-Team All-American status and an ACC Defensive Player of the Year award in 2004. Rachel made the Team USA roster in 2005 after her sophomore season, embarking on what would be a record-setting career. In 2007, as a red-short senior, she led the Tar Heels with 19 goals and was named Honda National Player of the Year. Rachel made the 2008 Olympic team, beating out Sarah for one of the last spots. The team won the qualifying tournament in Russia. She was named the event’s top player. Unfortunately, Team USA finished 8th in Beijing. The national squad won gold at the 2011 Pan American Games but again fell short of expectations in the Olympics, with a 12th place finish in London in 2012. Rachel led the Americans to gold again at he 2015 Pan American Games, but they just missed a medal in Rio in 2016, logging a fifth-place finish. Rachel returned from Brazil as the most-capped athlete on the team with more than 250 appearances.